Here at Patrick Whitefield Associates we’re settling down to the new regime, with Caroline Aitken and Morwenna Lewis teaching the residential Permaculture Design Courses and Patrick teaching the Land Course Online. You can see the background to these changes on a previous blog post here. In keeping with this, the blog is no longer written by Patrick alone but by all three of us. We hope this will give a wider range of posts on a whole spectrum of permaculture-related subjects. We also very much welcome your comments on our blog posts. You may have something interesting to add from your own experience, disagree with something we’ve written or simply have a message for us and other readers of the blog. We look foward to hearing from you. 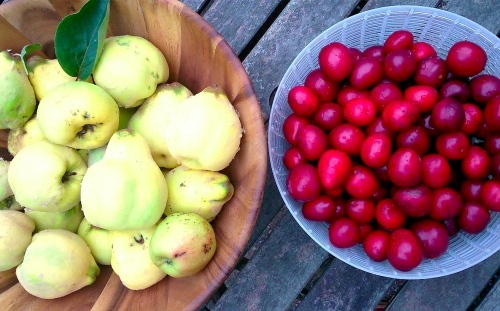 To start us off, Caroline has written this topical post about what to do with all those juicy autumn fruits which are dripping off the trees just now. Autumn is the time of year when many of us are busily processing our tree fruit harvests. Making jams and chutneys, syrups and cordials and maybe the odd tipple like fruit wines and infused spirits. There’s plenty that can be done with your produce, but sometimes it can be hard to find the time needed to do it all. Here are a few tips and recipes to help you manage the glut and fill your larder for the winter. There are various approaches to harvesting top fruit – apples, pears, plums and the like. It really depends on how you want to use the fruit. If you are harvesting table fruit that you want store for a few months it is worth climbing the tree to pick the fruit so that it doesn’t bruise and spoil in storage. You can get long, telescopic fruit pickers which avoid the need to climb (some of us just need an excuse, but not everyone wants to dangle for their pudding!) which are essentially a bag on a stick, with a toothed rim to pull fruit from the twig. If you’re harvesting fruit for cooking you can be a little less precious and collect it from the floor. The simplest method is to lay out sheets or tarpaulins beneath the tree canopy and give the tree a good shake. You can then gather up the sheets with the fruit inside. If you don’t want the fruit all at once you can wait for it to fall of its own accord and collect the ‘windfalls’. Once on the ground they can be collected by hand or using a clever device called an ‘Apple Wizard’, this is a round wire cage with a handle which you can roll along the ground. It really speeds up the collecting and saves your back, but the undergrowth needs to be fairly short for it to work effectively. Fruit pings inside the cage as you roll over it and can then be emptied into a bucket. All of this falling, rolling and pinging does bruise the fruit, so you’ll need to process it within a couple of days before it spoils. 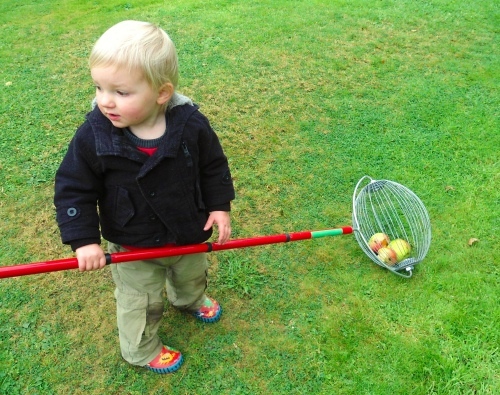 The ‘Apple Wizard’ makes collecting fallen fruit quick and easy. For smaller fruits and soft fruits you can also lay sheets down and drop fruit as you pick with both hands. Alternatively you can use a berry picking comb or ‘strigger’, a toothed tool which combs the fruit from the stalks. This works best with harder fruits as it can squash softer ones, and it does often bring the stalks with it. Windfall apples must be used quickly before they spoil. 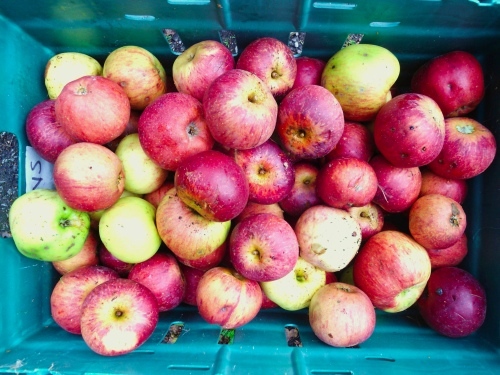 Certain varieties of apples and pears will keep for months if stored correctly. You need to be sure it is a ‘keeper’ as some varieties won’t keep, however well they are stored. Select fruit which is undamaged and fairly clean. A tried and tested method is to wrap whole fruit in a single sheet of newspaper and place in a cardboard box. The wrapped fruits can be placed on top of one another, but don’t cram them in too tightly, or in too many layers to avoid apples being squashed or bruised. You could also find a friendly green grocer and collect the boxes and trays that their apples are delivered in. The purple papier-mâché trays have apple sized indentations in them which hold the fruit in place, well spaced apart – ideally fruit shouldn’t be touching. Patrick has used this method for storing his apples for years with great success. You can also build or buy fruit storage units which are usually a wooden frame with lots of shallow, slatted trays for the fruit. 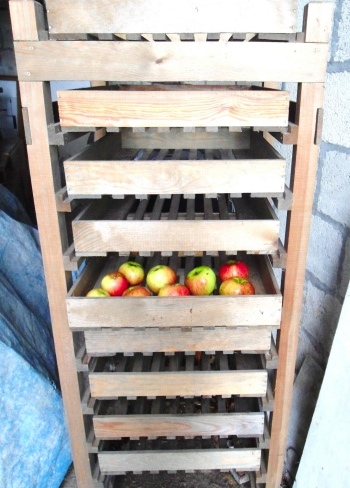 A storage unit for apples or pears. Your storage area must be rodent-proof. After taking such care to store your harvest, it can be heartbreaking to find nothing but a pile of mouse droppings in their place a few weeks later. Outbuildings are rarely mouse-proof, so you might consider using a heavy-duty plastic storage box, or covering your storage unit in a fine wire mesh. Some fruit and vegetables won’t keep, so they need to be eaten, frozen or preserved. Preparing food for any of these things can be time consuming, so here are some tips for speeding things up. If you’re going to freeze or cook these fruits you don’t necessarily need to peel them. If you really don’t want chunks of skin in the pulp you can use a blender or food processor to whiz them up once cooked and the skin becomes barely noticeable, especially in jam. Cores must be removed though, and I find the traditional ‘chitting’ method the fastest. Take the whole fruit and lay it on its side, then cut off one whole side as close to the core as you can. Turn the fruit onto the flat, cut side, and cut the next side off. Continue with the two remaining sides. If you want smaller chunks which will cook quicker you can quickly chop these big chunks up by hand or in a blender. Alternatively you can hold the fruit and take off big slices, like discs, all the way around and work your way in to the core. This is how my mother cuts her apples for apple pies and the slices sit in nice layers which cook quickly and evenly. If you don’t want to fully pulp the prepared fruit it can be blanched before freezing. Submerge the fruit into a pan of boiling water for about a minute, then remove with a slatted spoon and place in a colander to drain. It can be bagged up and put into the freezer once it’s cooled down. Pulping or stewing fruit in bulk and freezing in to smaller portions makes it easier to use and speeds up jam and chutney making too. 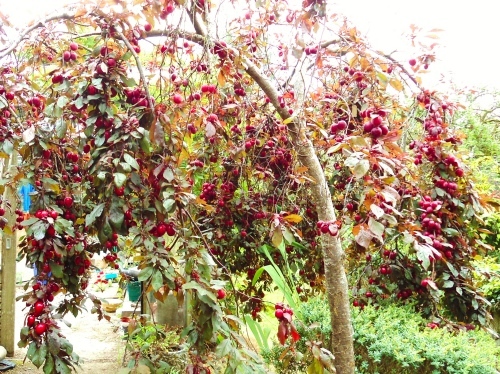 Plum trees can produce huge crops which don’t keep fresh for long. Plums, cherries, apricots, peaches and nectarines can be very easy to pit when the fruit is really ripe – you simply cut around the middle of the fruit then twist the two sides, leaving the stone in one side which can then be easily pulled out. This can be tricky with plums and apricots, so if you’re going to cook or preserve the fruit you can cook them whole or partly chopped with the stones in and remove the stones later. Once cooled it’s pretty quick to pour the pulp into a shallow dish and run you fingers through to find the stones. 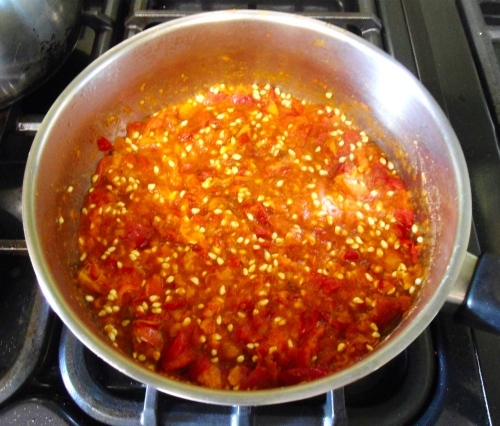 Jams and chutneys are very simple and easy to make and will keep for months. Keep your batches small so that they cook quicker – this uses less energy and less of your precious time, making it feel less of a chore and easier to fit in while cooking dinner for example. I would also recommend printing out your labels if you can – writing them can be fun but it can also take hours and once you have a template you can use it forever. 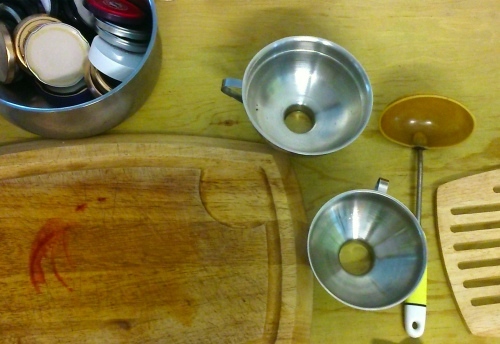 Jam funnels are a great help too, making jarring-up quicker, safer and less messy. Jam funnels can really speed up jam and chutney making. If using tricky fruits like haws, rose hips or medlars you can cook them whole and then remove the seeds later. 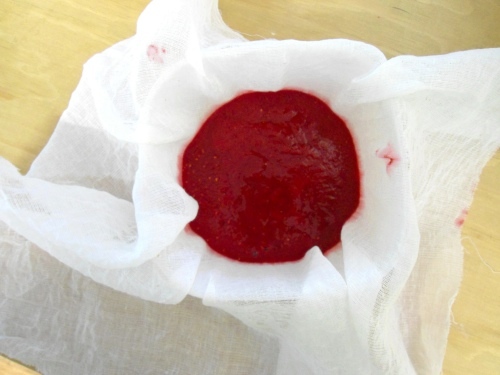 Martin Crawford swears by his Moulinex sieve, a hand operate device which pushes out the pulp but not the seeds – but for fruits like haws and rosehips you’ll need to use a muslin cloth too to ensure the fine fibres have been removed. I use a colander, a fine plastic meshed sieve or muslin cloth depending on the size of the seeds. For rosehips and haws I have adopted Hugh Fearnly-Whittingstall’s method. He whizzes them in a blender before cooking, then stews them with water and strains them through a double layer of muslin cloth, twice. This is by far the fastest way to prepare them and I’ve never had any trouble with fibres. …then passed through a muslin cloth.